According to reports circulated on TV, Messi’s family were insulted and assaulted by Chilean fans during the showpiece final. Relatives of Messi, including his parents and siblings, were “intimidated” by supporters at the National Stadium in Santiago, it was reported. Moreover, Messi’s family were reportedly “pushed” by Chile fans, as they watched the first half of the match from the stands. 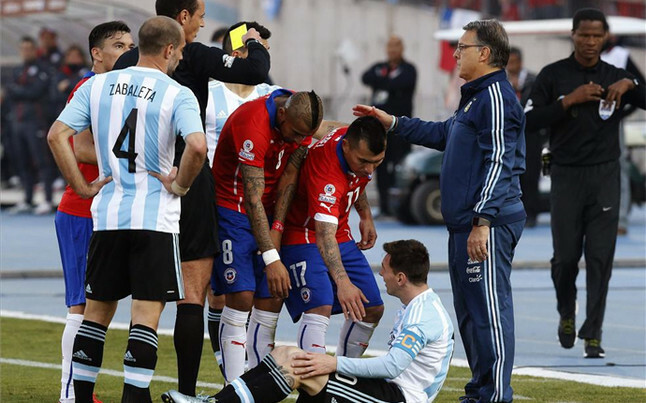 Rodrigo Messi, Leo’s brother, was also reportedly hit on the head by an object thrown by a Chile fan. Security needed to step in to protect Messi’s family from the crowd. See a news report into the alleged trouble aimed at Leo Messi’s family below.